Many people take for granted how much information is stored on a computer hard drive. From the inner workings of business to personal information about employees, it is all on the hard drives of our computers and printers. That is why Mobius Computers guarantees complete destruction of all hard drive data units. All computers, hard drives, and data tapes are transported in a secured, locked truck. All hard drives and data tapes will be shredded with our industrial drive shredder. 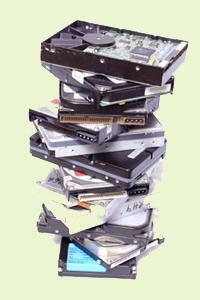 Shredded drives will then be transported to a local certified e-waste recycling facility for metal recycling. Upon request, a Certificate of Recycling and Data Destruction will be provided to the client upon completion of the destruction (typically 3-5 working days). Optional services include bar code scanning of drive serial numbers, photographic recording of all drive and tape units, and video recording of the shredding process. There are four key data laws holding businesses accountable for their employee, client and vendor information. By shredding hard drives and providing a Certificate of Recycling and Data Destruction for verification purposes, we guarantee all drives are in compliance with the following federal acts affecting how any type of entity needs to handle the destruction of your information. The law requires the destruction – “shredding or burning” or “smashing or wiping” – of all paper or computer data drives containing personal information derived from consumer information” before it is discarded. Federal law is intended to protect the privacy of student education records. Disclosure is only allowed by written consent of the parent or eligible student. To ensure the confidentiality, integrity, and availability of all electronic protected health information the covered entity creates, receives, maintains, or transmits. Companies must demonstrate a consistent application of their stated records retention policy in order to verify the SEC filings consistently match all paper and electronic documentation.